This weekend project is done. I like the result, but it isn’t rendered with luxrender though. I had some problems using luxBlend, especially with textured materials like leather and plastic. They use procedural textures from Blender and I was not able to figure out how to use them with luxrender. So it’s rendered with Blender Internal Render and some compositing (just defocus node & RGB curves adjustment). As you may notice there is no glass on the watch. This is because I had some bad shading issues with Blender Internal which I wasn’t able to eliminate. Luxrender had no problems with it so I don’t have any clue what could cause the problem. The project was nearly completely made with Open Source Software! 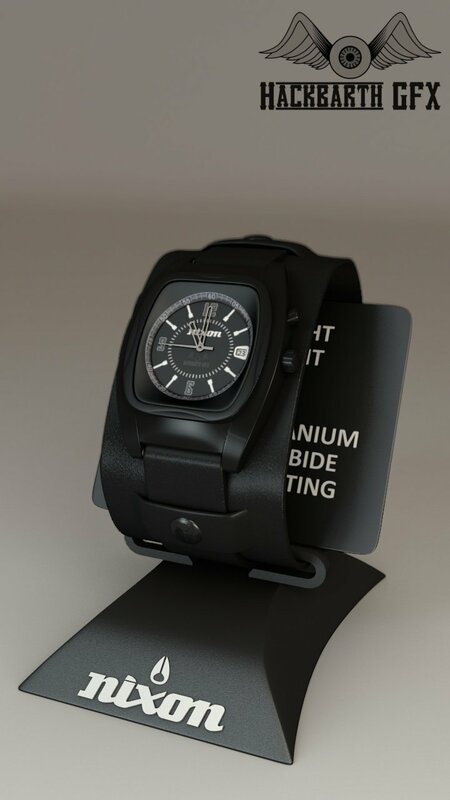 I just had one useable picture of the watch (besides the watch itself ;-) ) and I prefer to model by reference images. So I made references with Inkscape which is pretty awesome. Some textures are made with GIMP but for the main texture I had to go with Photoshop (mainly because of my lack of GIMP knowledge).